Indianapolis is full of outstanding multi-cultural talent, and there's nothing cooler than hearing your song blast out of someone else's car in traffic. If you would like to send in your music for possible radio play, there are a few guidelines to be aware of. These are listed in basic terms, so please contact us if you need further clarification on anything. Profanity and vulgarity are forbidden by FCC rules. We also choose not to push things that are aggressively political or religious in the interest of our diverse listening audience. So, please use your best judgment about content before sending. There are plenty of other non-regulated outlets (like podcasts) that exist for more extreme forms of expression, and we reserve the right to curate our on-air library. You are responsible for ensuring the radio-friendliness of your own tracks, including words and samples and background voices and shoutouts from live shows—in any language. A radio edit is totally legit if you need to scramble a word out in post. MP3 format is the only digital format we accept. Not WAV, AIFF, AAC, protected iTunes M4P, or anything else. The minimum bit rate is 192kbps. Take a minute to be sure that all of your metadata is complete. "Untitled-1 by Artist" or "Mixdown Final FINAL" are not helpful to us or you, because we need to be able to catalog and identify your work on and off the air. Mailing/drop-off address for CDs, records, tapes, thumb drives, etc: Tube Factory 1125 Cruft St. Indianapolis, IN 46203. It's a big purple building at the corner of Shelby and Cruft, please park in the designated lot. Note that materials will not be returned, and may become part of our listening library at Listen Hear. Please do not submit music before reading the important guidelines above. More questions? Just ask. All tracks submitted are for consideration only and are not guaranteed to end up on the air. 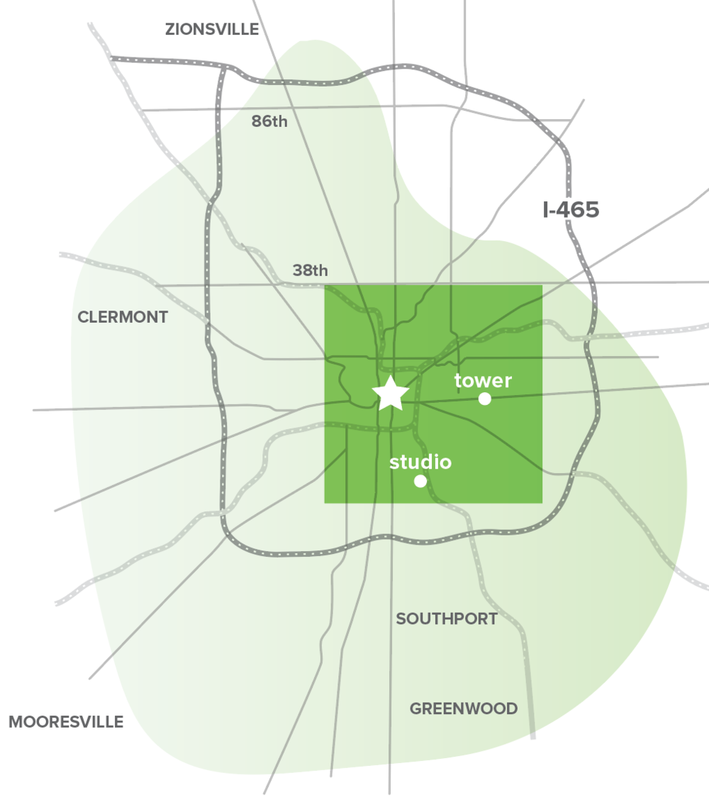 Sometimes we arrange to broadcast group or individual performances in-studio at our Indianapolis sound art space, Listen Hear, at Tube Factory, Big Car's headquarters and gallery across the street, or at special events around town with remote broadcast gear. If you'd like to get on the email/call list for those opportunities, please sign up for our email list below. If we should know about something right now, contact us HERE. We’re testing our 24/7 streaming service in beta mode now, and will continue to develop the way it looks and operates. Give it a spin! Donations and underwriting help keep that up and running and evolving—we’d always appreciate your support for those monthly costs. WQRT broadcasts at 100 watts from an eastside Indianapolis tower, with the potential reach of nearly 500,000 residents on the FM dial, plus commuters and visitors traveling through town. This map shows reported coverage area, with reception strongest in Center Township (indicated by green square on map).